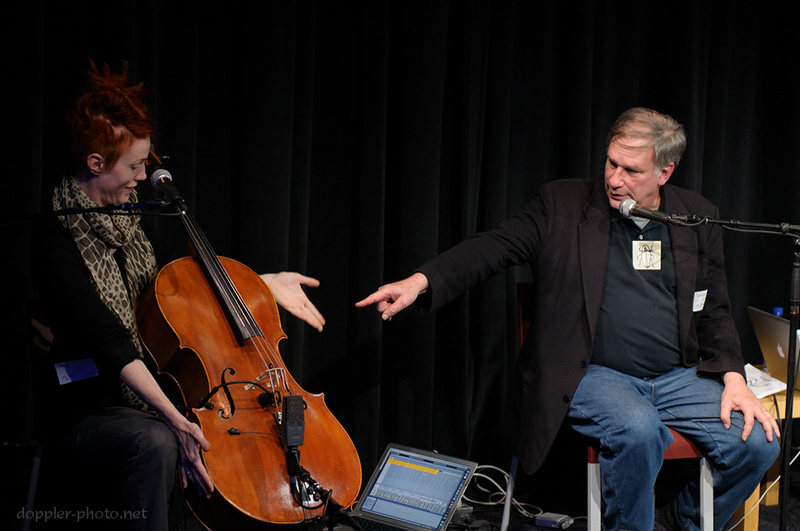 The co-hosts of WNYC's Radiolab and Zoë Keating have been on tour, performing a live show that they call Symmetry. 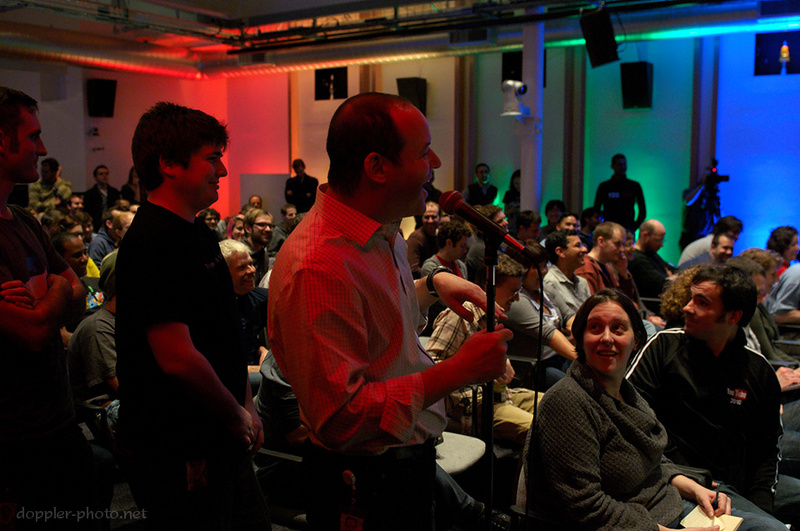 We were fortunate enough for them to stop by Google last week. As most anyone who's listened to Radiolab can attest, one of the defining characteristics of the show is its production style. Sounds clips fly back and forth, often unexpectedly, but somehow the final result is extraordinarily coherent, meaningful, and easy to listen to. If you haven't heard Radiolab before, give it a listen: Emergence is an early segment that they spent some time dissecting during Symmetry, and Words is my personal favorite segment. To start off, Radiolab co-hosts Jad Abumrad and Robert Krulwich discussed their goals and guiding principles in constructing the show out of speech clips and sound effects. 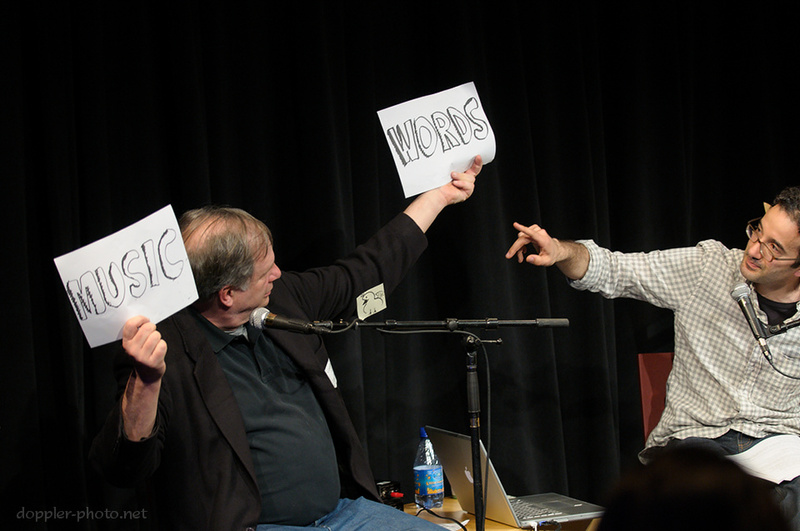 Robert (left) held the signs "Music" and "Words" to illustrate a continuum of methods of communication — from emotional to semantic. Jad (right) used sticky notes to illustrate approximately where certain sound effects fell on that continuum. It was an anthropomorphic infographic, of sorts. Above, Jad pinpoints bird sounds on the infographic — they're not really speech, but they still have a strong linguistic quality to them. You know that they're like words in some sense, even though you can't really understand what they're saying. Next Jad mentioned a sound effect he created to represent a firefly in the Emergence segment. The interesting thing, as he noted, is that fireflies are silent. He finally ended up with a snippet which was even more musical and less linguistic than the bird clip, which is why the associated sticky note ended up on Robert's sternum. The sound wasn't really semantically related to a firefly, but it somehow still felt like one. At this point, Robert invited Zoë to play a short piece on her cello, to illustrate the purely emotional end of their continuum. To continue to explain the differences along the continuum, Jad noted that the piece doesn't say sad or mean sad; it just is sad. It evokes sadness. 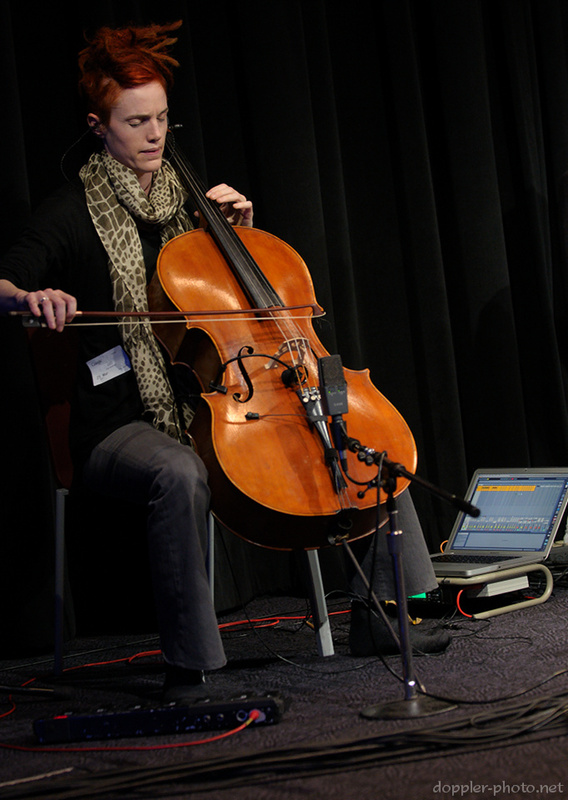 Zoë Keating describes herself as an avant-garde cellist. To borrow a line from her bio, "[Keating] uses a cello and a foot-controlled laptop to record layer upon layer of cello, creating intricate, haunting and compelling music." This layering is one of the reasons that the collaboration for Symmetry worked so well; there's a clear analogue between the techniques that Zoë uses to create her music, and the techniques that Radiolab uses to, as they put it, "confuse" words and music. The greatest similarity is that they're both iterative approaches. Jad and Robert described their production process as a balancing act between being too perfect (yet cold), and too sloppy. Essentially, they tried to disguise their perfectionism. The two told stories of repeatedly re-recording portions of their shows, keeping some bits and replacing others, until they finally approached a product that is at once precise, meaningful, and profound; that connects with the audience on both a semantic and an emotional level. 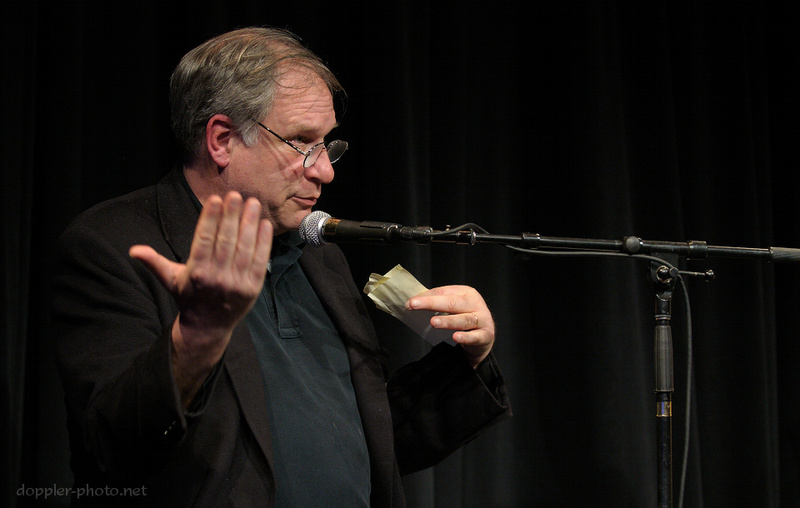 Jad compared Radiolab to traditional journalism by noting, "ours has to be beautiful." Similarly, Zoë's music creation process is highly iterative. She likens it trying to elucidate for the audience a landscape that she sees in her head. During the Q&A period, one audience-member mentioned that he noticed Keating closing her eyes as she played, and asked if she typically closed her eyes while performing. Zoë responded that "Yes, I am a very deliberate eye-closer." She explained that keeping her eyes closed helps her to use the cello to add ever-finer details to the composition — "That landscape, I see it when I close my eyes. When I open them, I see you, but when I close them it's right there." I don't have anything to say about the text or the performance, but the lighting on the audience is a lot more interesting than the lighting for the musicians. Please keep posting!